With nearly 1000 different species Australian Native Orchids species are a diverse group of plants. Some are large and free flowering, others are small and delicate. They are becoming increasingly popular as garden plants, however many do require exacting conditions to thrive. Epiphytic – These are the types that grow in trees. These are the most commonly grown of all, although they represent only about 25% of the species. Many are grown in hanging baskets. These are found on the east coast from Queensland to Tasmania. Lithophytic types are generally included in this group, however are different. Lithophytic – Sometimes called Rock Orchids, they naturally grow on rocks. In cultivation, many are grown in hanging baskets. Terrestrial – This is the largest group, they grow in the ground. They mostly flower in spring and die back before the heat of the summer. Many of these native terrestrial orchids are among some of the most difficult to grow, but also include some of the most beautiful varieties. Caladenia and Pterostylis are two species that are popular. Some such as Dipodium roseum are classed as saprophytic, they get their nutrients from dead or decaying matter. It is as simple as some are easy to grow, others are not. If you are starting out with Australian Orchids consider the native Dendrobium speciosum , the rock orchid native it’s a little easier in terms of care than other species. The Terrestrial types can be difficult to propagate, they rely on a soil borne fungus and its relationship with their seeds. Basically the fungus is needed to provide the germinating seeds with appropriate nutrients. In cultivation, some species can be grown in conditions that differ from the natural habitat. Others are very fussy. Given the right conditions, many Australian Native Orchids can be easy to grow in many areas. In general it is a matter of studying the natural growing habits and climate zones. The Australasian Native Orchid Society (ANOS) is a wealth of information with branches in all states and fantastic displays as well. Not that many years ago it was difficult to find these orchids for sale at all, today many species and spectacular cultivars are now available. Basic care of native orchids varies greatly, although it is the Epiphytes, the orchids that ‘grow on trees’ are perhaps the most widely cultivated. The terrestrial orchids all appreciate good air movement however with over 800 species of Australian Native Orchids it is a little difficult to be specific with care. The best advice is to try to provide conditions similar to natural environment for the species. More specific information is available from suppliers. 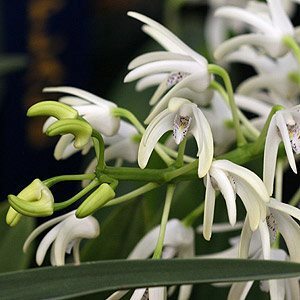 Australian Native Orchids includes a long list of species, popular types are Dendrobium, Dockrillia, Dendrobium tetragonum, Sarcochilus, Phalaenopsis, some are cool growing varieties others are tropical varieties. Deciduous terrestrial native orchids are a longer list and they are harder to find, Popular varieties including Caladenia, Chiloglottis, Corybas, Cyrtostylis, Diuris, Lyperanthus, Microtis, Pterostylis and Thelymitra. Many of these are suited to naturalising into the woodland garden or growing in pots and containers. Growers and hybridisers of Phalaenopsis, Zygopetalum, Australian Native Orchids and other orchids.